My boss knows about TDD but won’t allow us to use it because he thinks that it is just a passing hype that everyone talks about but no serious, big projects actually use it on daily basis. How could I convince him that it is not so? There is no magical argument I can make to convince someone that TDD is a good idea: logic may not be persuasive here, but experience is. I am not arguing here that 1 + 1 is 2, but rather that if you follow these practices, the result is subjectively better. Since there is so much subjectivity in this, people need to experience TDD to understand its benefits. It is very hard to learn TDD by someone trying to learn it from a book. Learning TDD is more like learning to ride a bike: You can read books on how to do it and you can have silly arguments with theorists on how you can’t ride a two-wheeled contraption because it is inherently unstable, but nothing makes you a believer more than actually riding a bike. The first time you ride a bike it is a very clumsy experience, and I would argue that it takes hours of falling and uncertainty until you are better at it than walking: don’t expect TDD to be any different. It is a skill that takes hours of practice to master. Don’t argue with someone over your experience; instead, make him live through the same experience. To me, nothing is worse than someone trying to sell something that he doesn’t fully understand. Make sure you are reasonably good at TDD and have built a reasonably sized application before you try to show someone else how to do it. Imagine someone who has only seen others riding bikes trying to teach someone to ride a bike: my guess is that he will only frustrate the person learning. For this reason, build a small app with TDD in your free time. Your first tests will be the hardest, and at times you will think “this is way more trouble than it is worth,” but keep in mind that you struggling because you are learning a new skill. You have been developing code the old way for years: What makes you think that you can pick up TDD overnight? TDD makes you think about tests first, something that you have never done. It will not come easy, but in time it will become second nature to you. It took about one year before I felt that writing code test-first was the natural flow of things. I cannot overstate the importance of learning TDD on a brand new project without deadlines. Start something new in your free time and build it with TDD. Use it as a learning experience. You will: discover all kinds of things about how to best write code, get a feel for telling apart helpful tests from those that get in the way, learn how to think about the problem from a test-first perspective, realize the importance of not getting ahead of your tests, and discover that your code looks nothing like what you envisioned. Code with tests looks different. Try to refactor code written test-first and you will see that some tests are helpful while others get in the way. You first have to live through this experience to become familiar with the kinds of tests that get in the way of refactoring, and to know how to turn them into the kinds of tests that help you refactor. To know both one and the other you have to first build something with TDD. Since you will be struggling a lot at the beginning, trying to bring TDD to an existing project may only fuel your boss’s feeling that TDD is not useful. Again, TDD is a skill and takes a while to develop. We all believe that good code is reusable code. For this reason most of us add all kinds of interfaces and abstraction in the name of reusability. But what percent of the code you have written have you actually reused? I would say a tiny fraction, very close to zero. One reason for this is that your code isn’t reusable, even though you believe it to be. Tests help ensure that your code is in fact reusable, because they force you to write classes that can be used both in production and in a test scenario. If you can’t write a test, you don’t have reusable code. If you write test-first, then it is very likely that the code is reusable: after all, you just used it in tests and in production. This is the single reason why test-first produces better design. On the other hand, if you write code as you always have, you will most likely end up with hard to reuse code. If you write tests afterward, then at best the tests are an afterthought hacked on top of the production code; such tests are very unlikely to help us when you are refactoring, since they are likely to produce false negatives. Did you know that average chip can have as much as 50% of its silicon dedicated to testing? Why is it that every discipline out there takes testing seriously except software? I believe it is because of the presumed inexpensive nature of fixing bugs. A new rev of silicon is extremely expensive. As a result, most companies can only afford to rev it about 5 times. Can you imagine writing code such that you are only allowed to run the production 5 times? Yet hardware folks can’t imagine designing chips any other way. The cost of another software rev seems close to zero, and this is where people get into trouble: We believe that another build costs us (almost) nothing, and this belief becomes our death by a thousand cuts. The more complicated the project, the more likely it is that a fix in one location will cause a bug elsewhere: the project is forced into an endless cycle of regressions. Tests help here, but again, this needs to be experienced. Sometimes you just have no idea how to write code test-first; there are a lot of reasons for this. Instead, you revert to good old fashion hacking. That isn’t a problem as long as, after you first code by hacking, you go back and write tests, or preferably, completely re-write the code test-first. you call this “spike”; I do this quite a lot when faced with new technology or environment. Just don’t let this become the way you develop software. If your boss is micro-managing how you do things and you have tried everything to explain your position, you always have the right to vote with your feet. Last time I checked, we software engineers are in high demand, so there is no reason to work for people who are being counterproductive. When I develop code I write test first and always run my tests. But it can get rather tedious to run the tests manually every so often. Here is a common scenario. Your tests are green and you start doing whole bunch of refactorings which you think are trivial and safe. When you are done you run the tests and it is broken. The problem is that you did ten little things and you don’t know which of the ten things you did broke the code. The solution is to run the test more often, but we just forget. What I want is to have my IDE run my tests every time I do a change without me doing anything. This way even though I am doing ten little changes the IDE runs the tests ten times. The moment you do something which you thing is safe but it turns out that it makes your tests fail your IDE should tell you. You than simply hit Cntl-Z (undo) and you are back in business. What I want is for my IDE to run my tests every time I save the code. To do this my tests need to be fast, because my patience after hitting Cntl-S is about two seconds. Anything longer than that and I will get annoyed. If you start running your tests after every save from test zero you will automatically make sure that your test will never become slow, since as soon as your tests start to run slow you will be forced to refactor your tests to make them faster. Obviously this technique is only useful for true unit-tests since they are fast. I do not run my scenario tests as part of Cntl-S. Create a Project: Eclipse has this cool feature which compiles your code continuously on every save. This is great, as what it really means is that your code is always compiled and you never have to wait for a compilation step in eclipse. Create an ANT build file which will run your text runner from the eclipse compiled folder. This way the ant does not have to continuously compile your code. Tell Eclipse to run your ant target after every compilation cycle. This is known as Builder in Eclipse. Or just grab my repository form here and import the already made project 00_AutoTest and try it out. 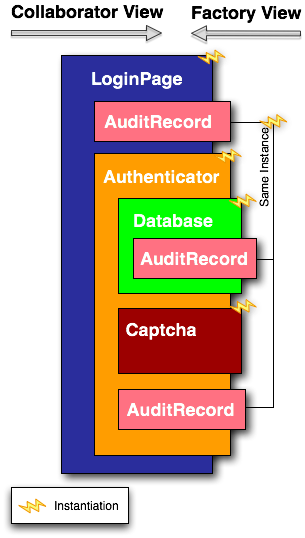 Therefore, typical implementations of the Active Record pattern consist of instance properties representing a record’s fields in the database, instance methods that act on that specific record and static methods acting on all records, i.e. the database table or view. David Hayden gives a nice overview of how this pattern might be implemented in his article Active Record Design Pattern – Domain Driven Design and Domain Layer – Object Persistence. I would hazard to guess that almost anyone who has developed web applications with Ruby On Rails would testify to the utility and even aesthetics of the Active Record pattern. For the record, I share this admiration. However, I can see problems lurking inside of the various implementations, in terms of both design principles and testability. Some would say using Static methods simply amounts to procedural programming, and therefore is poor Object Oriented design. Others would say static methods are death to testability. In our example above, the Account class needs to connect to a database (or some source). You will find that most Active Record implementations have some kind of application config file. For example, Ruby On Rails uses a YAML file to persist the application’s database connection settings. Therefore there is no dependency injection on the Account class in my example, and by extension, on the Account instances. As we should all know by now, looking for things is very, very bad! Separating responsibilities for the table and the records into two separate classes provides a better design and a decent shot at genuine testability. Guide to testability is now downloadable thanks to Blaine R Southam who has turned it into a pdf book.